Leaving wet winter gear on the ground can be harmful to your floors and cause unsightly clutter. Here are some winter organization hacks to help your household stay dry and tidy all season long! Have you ever taken a step too close to your entryway in the winter? Unwillingly, you step into a small puddle, draining from somewhere near the mountain of snow-covered coats and shoes. We all know that feeling — there is nothing worse than a wet sock. That’s why we came up with these easy DIY Mudroom Ideas to organize your winter gear! With a smallish entryway and no real back door, this homeowner had to get creative when it came to dealing with winter gear, especially boots. 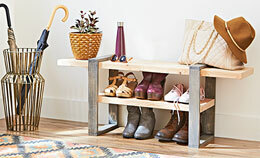 The solution: a combo bench and boot rack that keeps drippy footwear off the floor. The bench is perfect for changing into or out of boots, and a cloth mat catches excess water before it can hit the floor. 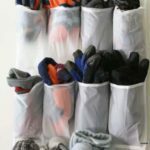 A simple over-the-door shoe organizer ($13 to $25) is great for storing (and organizing) hats and gloves. Get clear plastic so everyone can see what’s what at a glance. Also perfect for stashing orphaned mittens until a mate finally appears. 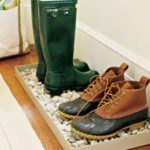 A plastic tray filled with a layer of black river rocks ($3 for 28-ounce bag at craft stores) lets boots drip dry inside without messing up floors. Got some four-legged friends? Leave space on the tray for dog booties ($12 for a pack of 12) that’ll keep paws dry and warm your heart. Got your long-handled tools stashed all jangled up in a corner of the garage? 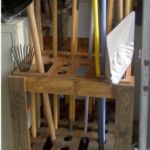 Get straightened out with a homemade tool rack. Holes for pole-type handles; slots for tools with D-ring handles. 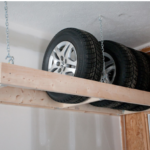 Put the rack inside your garage to keep snowshovels and ice scrapers close at hand. 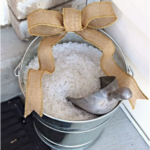 Stash your deicing salts right where you need them – outside by your front door. A stainless steel or galvanized steel bucket ($15 to $20) and big metal scoop (60 to 85 ounce; $10) make attractive helpmates; a fat ribbon keeps everything festive. 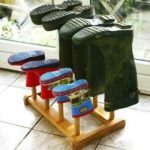 Keep messes and drips outside with a homemade boot rack. This rustic version features trimmed tree branches, complete with bark. Upright branches are screwed in place from underneath the long support. Parking your boots (or wellies, if you’re English Canadian or a Brit) upside down ensures good drainage and prevents snow and other precipitation from getting inside. In many parts of the country, winter weather means changing out tires – and a dilemma: What to do with your summer tires? They’re big, awkward, and heavy. This Ohio homeowner built an out-of-the-way tire rack using 2-inch-by-6-inch lumber. Metal joist hangers add strength, and the rack is suspended from screw hooks driven into ceiling joists. Don’t forget to give yourself enough room so that tires fit between the rack and ceiling when loading and unloading.